Hidden away in a quiet location on the outskirts of San Antonio, the popular 2 star Hostal Valencia is a favourite choice with couples. Peace and relaxation are the key to your stay at the Hostal Valencia. Catch the first rays of the sun over an al fresco breakfast on the sun terrace, then chill out in the garden or take a dip in the swimming pool. No need to wander too far for a cooling drink or sandwich, with a snack bar close at hand. If you fancy a day on the beach, Calo des Moro, Cala Grassio and Cala Grassioneta are within walking distance. The comfortable air conditioned guest rooms are the perfect place to relax, before enjoying one of the famous Ibizan sunsets over dinner. The bright lights of San Antonio centre are just a ten minute stroll away, if you fancy being a party animal for a night. If you are looking for a real home from home, discover why the 2 star Hostal Valencia is a hidden gem for Ibiza holidays. 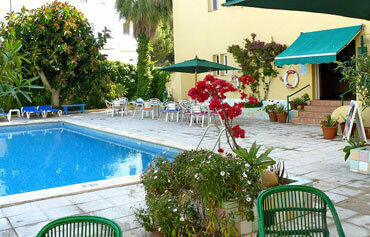 The Hostal Valencia offers guests all the facilities you would expect from a 2 star hotel in Ibiza. Highlights include a swimming pool, two attractive sun terraces, garden, 24 hour reception, bar/cafeteria, lift, TV lounge, daily room cleaning service, Wi-Fi and seasonal guest house (June to Sept). The snack bar serves delicious breakfast, main meals and sandwiches. An a la carte breakfast is served on the sun terrace. The bright lights and nightlife of San Antonio are just a 10 minute stroll from the hotel. 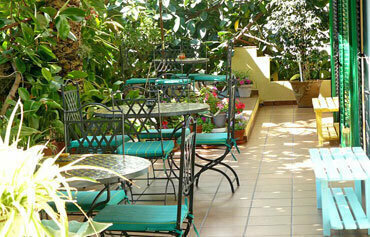 The Hostal Valencia offers 21 stylish and modern double rooms. 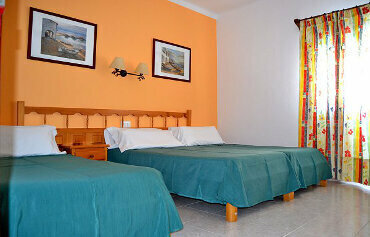 Room facilities include: air conditioning, a full equipped bathroom and Wi-fi. Some rooms boast a terrace and others have views of the swimming pool. The Hostal Valencia is located to the north of the resort of San Antonio and a 10 minute stroll from Calo des Moro, Cala Grassio and Cala Grassioneta beaches. 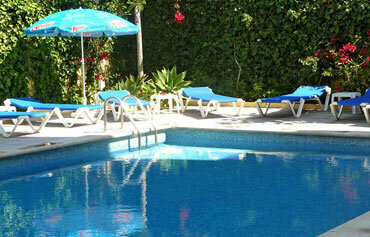 The hotel is 10 minutes from the centre of San Antonio and 20kms from Ibiza Airport.